MARY FISCHER was born and raised in the Midwest, the heartland of the country. She currently lives in the Truckee Meadows of Northern Nevada, surrounded by the beauty of the mountains. After retiring, Mary became involved in various volunteer activities. She has been a hospice volunteer for over twelve years, visiting patients and providing respite care for their families. She has served as a group grief facilitator for children who have faced the loss of a loved one. In addition, she has been involved in reading programs in schools, mentoring programs, and youth golf programs. Mary loves to travel and experience new sights, different cultures, and the marvels of the world. She enjoys golf and spending time with friends. Her greatest pleasure is spending time with the family with which she has been blessed. 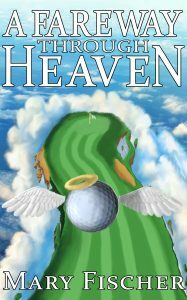 When an urgent and unexpected call to Heaven interrupts his long anticipated round of golf, Tom suspects a practical joke. Unfortunately, it’s not. Usually clear-thinking, practical, and easy going, Tom’s perception blurs. Certain his situation is a mistake that must be fixed, Tom works every angle he can find to get back home. Finally, he hears of a loophole that allows passage between the realms of Earth and Heaven. Join Tom on an inspirational and often humorous adventure that leads him to question not only his own death, but the essence of life itself.